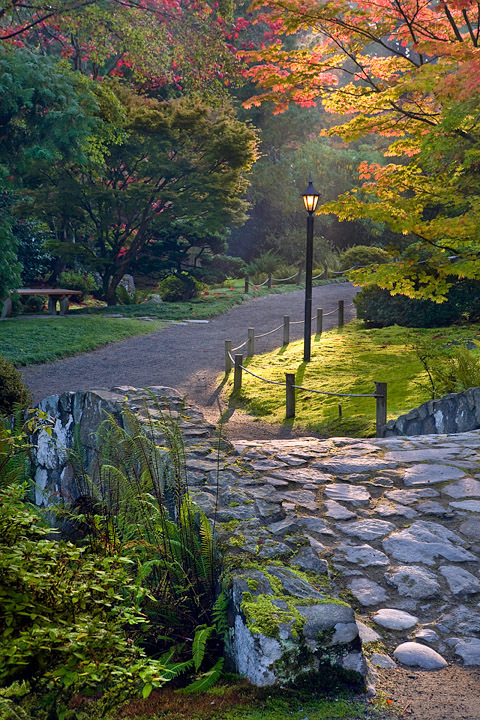 I’ve recently signed a book contract to produce Japanese Gardens of North America with writer Kendall Brown, and it’s due out in spring 2013. So lately the garden landscape has been on my mind, especially as it pertains to the Japanese garden. The best way to begin photographing the garden landscape is to hold off on shooting, and walk around instead and notice the site lines, structures, water features, flower beds, stone work, and anything else that makes up the garden. 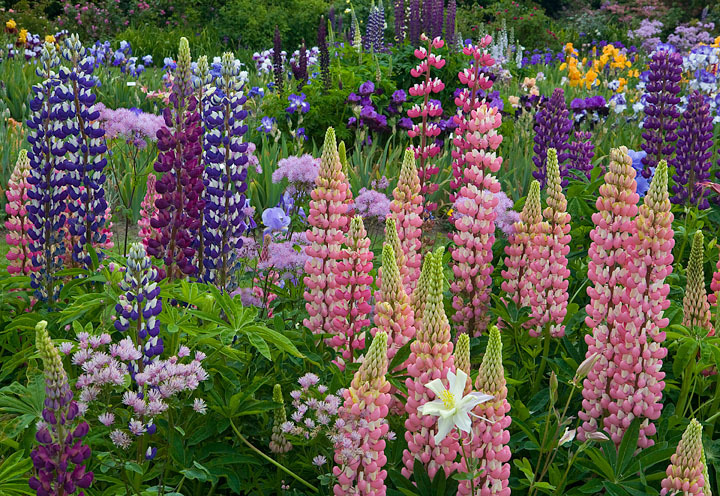 Observe how the gardener has arranged the colors of the flowers—are the colors harmonious, complementary, or uniform? Notice the light and where it is, and also envision where it will be, so you’ll be ready for those other shots later in the day. When will that colorful patch of flowers be in the shade and ready for shooting? Make a note to come back later. Keep an eye on color and make a note to come back later. I often begin photographing the garden with the “get to know you” shots. These are the general all-purpose images that can give a nice overview of the vicinity. Sometimes I wait until the view is without visitors, but sometimes I include them to give the garden a sense that other people actually visit and enjoy it too. With garden photography, I almost always use a polarizer to cut down on leaf glare and to also create further saturation of the colors. Once I’ve taken that overview image, I start to narrow my field of focus and look for leading lines (sidewalks, fences, flower beds), and a foreground (bright flowers, large stones, or colorful leaves) to help create depth to my image. Setting up a good garden landscape shot is the same as setting up a good landscape image anywhere–with the exception that for garden landscape images I rarely include the sky and often frame my image part-way up the distant trees. There are usually a variety of gardens within the garden, and I photograph an overview of each one separately. 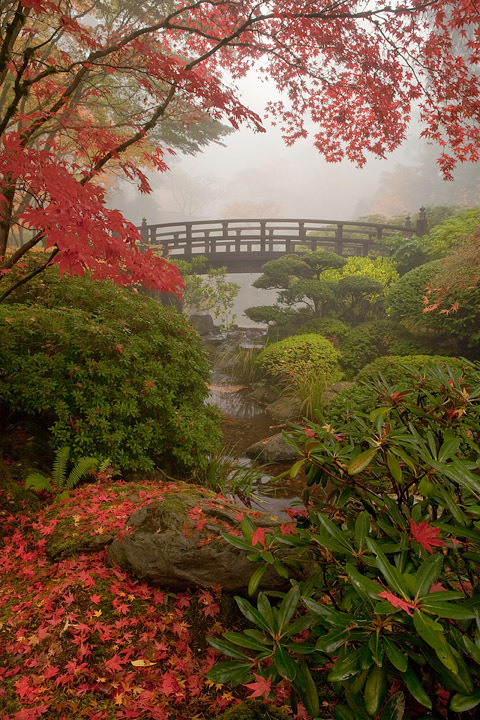 For instance, in the Portland Japanese Garden there is the Sand and Stone Garden, the Flat Garden, the Natural Garden, the Strolling Pond, and the Tea Garden. I photograph each garden separately as a landscape, and then I begin to look for the more intimate compositions. For the garden landscape my lens of choice is the 24-70mm. A wider angle lens causes too much distortion to the trees, garden art, or garden structures. Therefore, to keep things more in perspective I’ll often photograph between 35-60mm. A few more tips to keep in mind are to photograph the garden in the morning when there is little wind and also better light, and avoid those bright sunny days if you can help it. Try instead for an overcast day which will add even lighting and better color saturation. Better yet, go when there’s a thick fog to bring out the mystery of the garden. The garden setting is one of my favorite places to photograph. I love the beauty of it all and the challenge of capturing that splendor. It is a place to feel creative with your photography and a place to expand your limits as a photographer. If you’re interested in signing up for one of my garden photography workshops, please do at http://dmcobbphoto.com/dc/shop/weekend-workshops/ . We’ll be based out of the Oregon Gardens in Silverton this May, and a few spots are still available. ~ by photocascadia on February 14, 2011. I’m usually not much of a fan of images with the hand of man in them, but the second image with the lamppost is just stunning. Really, really great! I love this kind of advice! It gives us a practical, step by step plan to experiment with for garden photography and should come in handy at the ‘Oregon Garden’ workshop. Thanks Dave!